Now available for streaming and download - the third edition of the OTHERWORLDLY AND GONE 78rpm podcast, “Signals, Calls and Marches”. Full playlist below. You’ll hear new archival releases from Bulgaria, Greece and Turkey, as well as otherworldly lost sounds from all corners of the globe, including Bolivia, Mozambique, Ukraine, Sweden, India and the American cajun bayou. Subscribe on iTunes or just listen here. Please follow Otherworldly and Gone on Twitter and on Facebook if you enjoy this one; the first and second editions, each also about an hour, are available to stream and download right here as well. 3. GERGANA TSEKOVA – Kako Todoike, Todoike – taken from the 2/23/09 Excavated Shellac blog post here. 4. ELIN LISSLASS – Locklater – from the “Secret Museum of Mankind, Vol. 4” CD compilation on Yazoo. 5. 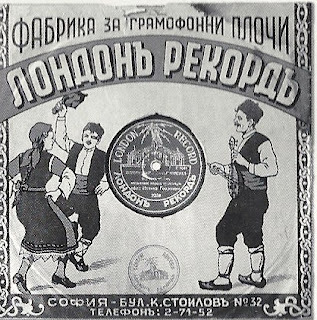 NECMIYE HANIM - Sabah Oldu (Daybreak) – from a new LP of all-female Turkish 78rpm songs called “Nightingales & Canaries”, which you can buy here. 6. CLEOMA BREAUX & JOSEPH FALCON - La Vieux Soulard et sa Femme - from the “Anthology of American Folk Music” collection. 13. ALBERTO RUIZ – Tonada de Tarka Con Callaguas – also from “The Secret Museum of Mankind, Volume 4” CD collection on Yazoo Records. 14. STELLA HASKIL– Bir Allah – from “Bed of Pain - Rembetika 1930-55”, available as an LP, a download or on Spotify. 15. IRIARTE AND PESOA – Libertad – downloaded from the Excavated Shellac blog, 5/21/07 post. 16. BRODER KAPELLE – Chernovitzar Bulgar (Dance from Chernowitz) - from the “Aimer et Perde” 2xCD collection on Tompkins Square Records.